As of last year, it had been four years since Cody-Rose Clevidence published their last full-length book of poems, and going by the author’s statement for their new book Flung Throne on the Ahsahta Press website, it hasn’t been the happiest of intervals. Clevidence’s response has been to live in the sticks and write poetry that could tempt you to give up about halfway through the first page, exclaiming “I don’t get modern art!” or some variation of that phrase. But boldly and unapologetically abstract though it may be, Flung Throne is one of the most timely and necessary books I have ever read. There is no narrative to speak of in Clevidence’s poems, nor are there sentences. Often, there aren’t even words. The closest thing to a story in Flung Throne is a hallucinatory, all-caps summation of the early stages of life on this planet. 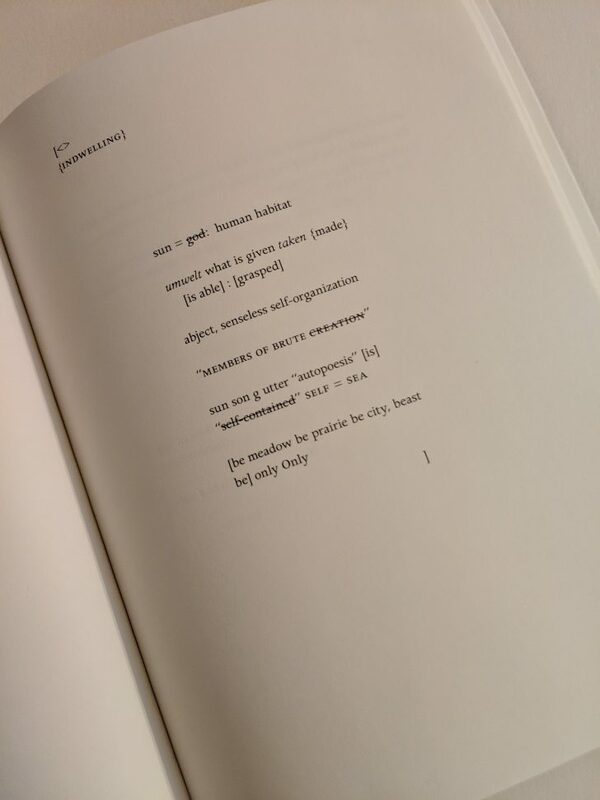 The piece describes “BIZARRE FORMS” that began “TO CROWD OVER THE IMMENSE & ANIMATE EARTH.” The beginning of that poem, titled “(AGATE/ALGAE)” is almost exclusively composed of punctuation, which is in turn punctuated by letters and truncated words. Now, if “(AGATE/ALGAE)” either has no message, or its message is so difficult to decipher that it might as well not exist, what’s the point? Why write it? Why publish it? Why waste the paper and electricity? Well, the easy answer would be falling back on the “why does it need a point?” rationale. But that argument feels kinda lazy and tiresome after you hear it the bajillionth time, or even after the second go round. A poem needs a point because we have limited time and attention which could be spent volunteering or doing anything besides slogging through 132 pages of $18 garble. The harder answer⎯or rather, the point of Clevidence’s work⎯is lodged in the dizzying space between sense and nonsense, between the need for workable politics and the recognition that nothing political is comprehensive. That’s the space this book occupies. Clevidence loves caps lock. (So do I.) But the worry they gnaw at here is that as soon as you start to draw lines in the sand between concepts, between categories of being, you have set the stage to value these categories differently, and therefore hierarchically, which creates a platform for those safely within the margins of the “higher” categories to inflict violence on those in the “lower.” And those residing within the “higher” groups can be especially hostile to those who are so close to the imagined lines that their very existence calls the whole construct into question. Beast Feast revels in the attempt to embody this relentless dissolution. Flung Throne, on the other hand, still contains some of that initial spark, but like a wizened anarchist, it has become less hopeful about the prospects of smashing everything until everyone is equal. Even the relationship between the two titles illuminates this change. Beast Feast is a spondee at its most percussive; a pair of fangs bared to the wall it is backed against on both sides. Flung Throne is a spondee as well, but with longer vowels, a more slanted rhyme, and without the hiss implicit in the first title. The strike through the word “flung” implies that the writer has attempted, and failed, to cast off their throne, to renounce the tyranny that being human in this age and this country necessarily entails. What we’re left with is a new attempt⎯the contemplation of the throne, of how to live justly knowing that the power we have is only made real by imagining, but for all practical intents and purposes, is real nonetheless. The first step in this process is paying homage to our roots. And in Clevidence’s book, that means, like, the deepest roots possible. These roots are twofold⎯bodily and etymological. This is the primary concern of Flung, which consists of two long poems. The first is “[AGATE/ALGAE].” Let’s return to that poem’s first page, the mound of punctuation I mentioned earlier. At the top it starts out as just a few sparse periods and colons. Slowly, more kinds of punctuation arrive, as well as letters, then word fragments, and eventually phrases, getting denser and darker as you move down the page. On a purely visual level, this resembles two things: the increasing density of the earth as you get deeper and deeper into it, and the increasing darkness of the ocean as you do the same. But zoom back in on the “characters” and the “story” gets even better. The characters chosen aren’t just random letters of the alphabet. They are predominantly letters that show up in the contexts of genetics and roman numerals. In this light, the page becomes an exploration of the accretion of forms through geologic and chromosomal time, ending with a “:;proto-eye.::;. ;;:.opened in::;an:;. ::;;ocean,” the first time a living entity can watch this process and reflect on it, or be reflected on by it. This page alone is an immense accomplishment. 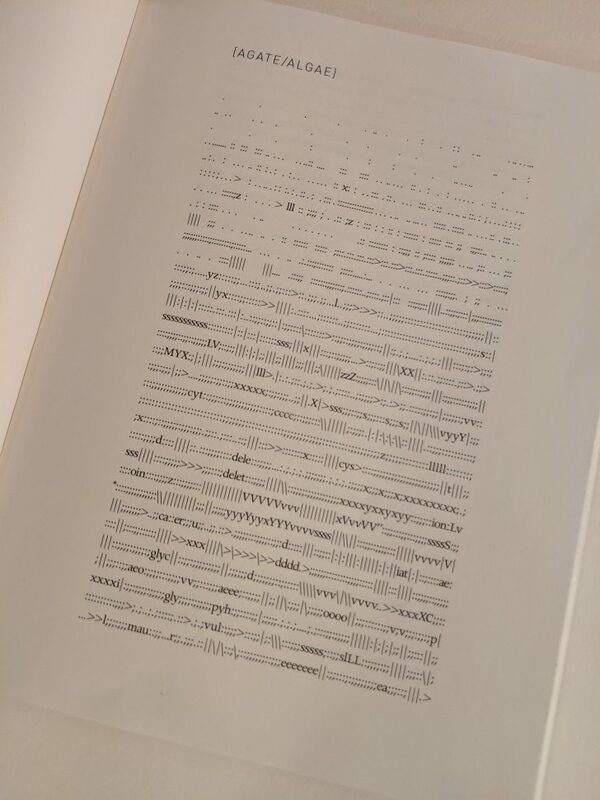 It takes concrete poetry⎯that thing we all learned about in grade school, then promptly forgot because of how gimmicky it usually is⎯and infuses it with the urgency and time warping and tears in the fabric of communication that are typically the domain of a good acid trip. And that’s just the first page. Clevidence goes on to diligently soak in what a “lineage” of rock and green muck means for us as people, simultaneously working through how the roots of English words and works in Latin letters and Greek myths affect how we think and how we categorize. Most of what this comes to is a deep sense of humility, indebtedness, and humor helping wash down the knot in your throat that is the guilt and terror of living consciously in the current geological age. Clevidence peppers lines like “dumb as the dumbest beast / that dumbly beats the earth” throughout the poem, continually bringing us back to how small and short and silly humanity’s place is, but without making light of anyone’s suffering. The rest of the book contains a small collection of poems from Clevidence’s chapbook Scum, Rejoice, which functions as a kind of interlude between the two main sections, and Throne, a grouping of poems dealing with the second stage of the book’s overarching aim⎯working through the question of how to live, and with what in mind. Throne is not as consistently breathtaking as Flung, but every poem has its shining moments, and there are a few bonafide stars. One of these stars is “APE|ANGEL,” a poem whose title recalls “[AGATE/ALGAE],” but contains important distinctions akin to the differences between Beast Feast and Flung Throne. The brackets and slash in [AGATE/ALGAE] set the two subjects up as analogous structures contained in the same space, not equivalent but comparable, either/or. “APE|ANGEL” is a direct foil to this setup. There is no casing keeping the two words together, and the line between them enforces the border instead of collapsing it. The first lines further mark the distinction: “you wounded ape have fell / from grace some trees,” and in falling from trees, what we mostly got was an “endless Capacity for / grief.” Put that on a t-shirt. The poem is full of these glib cut-downs of human ego, but an acute awareness of our limitations sobers the piece in the same turn. This book could not have come at a better time. With plastic in our sea salt, fossils choking the atmosphere, and lakes of toxic sludge in China, it has become kind of a fad over the past several years for poets to turn to different parts of nature to inform their poetic form. I attended a reading with a poet who read her manifesto subverting an old concept of the poem as a machine. She made the case that we should think of poems as animals instead, and “allow them to have a soft underbelly.” A couple poets are working along similar lines, but with “vegetal poetics.” They’re interesting projects, but they feel a little like museum displays that plucked singular beings from their context, and played isolated recordings of them before some audio engineers argued that museums should be recording and representing the full soundscape of ecosystems to give people a sense of their interconnectedness. Cody-Rose Clevidence is doing the same with poetry⎯venturing deep, mic in hand, to record the animal, the emotional, the vegetal, the bacterial, the philosophical, the mineral, the lyrical, all in the hopes that thrown into this mix, we might learn to act humbly, and earn some comfort. Flung Throne is a difficult read, but no more difficult than trying to live well.